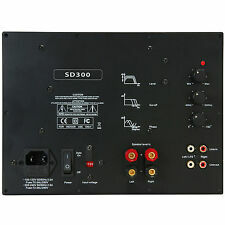 Bash 300S Digital Subwoofer Plate Amplifier 300W RMS. Features: 50 to 150 Hz low-pass crossover, 0° or 180° phase, line level inputs, speaker level inputs, LFE input, master on/off switch, auto on. Phase Switch 0° or 180° selectable, 0° is normal phase, 180° will reverse the polarity of the subwoofer output. Underpowered for the wattage it claims. I currently have a 150w Memphis Audio Street Edge with 2 10" Kicker CVR Comp subwoofers in series presenting a 4 ohm load to it. Changing only the amplifiers out I was unable to get an acceptable level of bass at any frequency or level of gain. I would not recommend this to someone looking for any meaningful bass out of a home audio setup. Out the gate, this thing demands respect. After my Klipsch sub-10 amp went out on me, I started looking and Came across this little guy. Bash makes amps for Klipsch subwoofers so I thought what the hell. For 300watts this thing is serious and barely gets hot. Only had it for a week now, but so far so good. I recommend it. Top quality electronics with a working mans price tag on it.